Suleiman Hashimu, will no doubt enter the Guiness Book of Record as the first man to trek from Lagos to Abuja. 'The Traveller,' as he is now been called, had vowed to walk from Lagos to Abuja if Muhammadu Buhari won the 2015 presidential election. Hashimu arrived Abuja yesterday evening after trekking for over three weeks. ‎Hashimu, a native of Katsina State, said he was in Lagos when Buhari was announced the president-elect of Nigeria, so he left Lagos at about 5am the next day and arrived in Ibadan around 6pm. 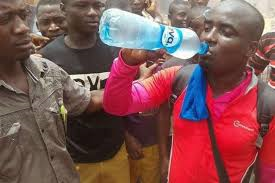 The Traveller narrated how they encountered armed robbers close to Mokwa, but that, fortunately, he had already met one of them in Jebba and the would-be robber ended up giving him N200 for 'pure' (sachet) water. ‎Unconfirmed report said a top politician had already paid for a room in Transcorp Hilton where he would lodge. "Most Beautiful Model In Nigeria Final Audition Holds In Abuja @ CHILLIS LOUNGE, Ahmadu Bello Way, Opp. Unity House, Area 11 Garki On Saturday- 2nd May, 2015 By 11:am! ‎"